In this month’s newsletter, I’ve been writing a short weekly article about procrastination and resistance, and I wanted to carry on this theme in today’s blog post. If you’re missing out on the newsletter, click here to find out about it – the link will open in a new tab so you don’t lose your place here! Over the years – particularly since I started working for myself – I’ve done a lot of reading and thinking about procrastination and resistance. There’s no denying that they’re very real forces, and that they can be particularly destructive for writers. While some people like to imagine writers working in bursts of frenzied inspiration, the reality doesn’t generally look like that. There might be wonderful moments of flow – I’ve certainly had writing sessions where I lost track of time because I was so focused on putting words on the page – but a lot of the time, being a writer is about sitting down and getting on with it. Even when you don’t feel “inspired”. 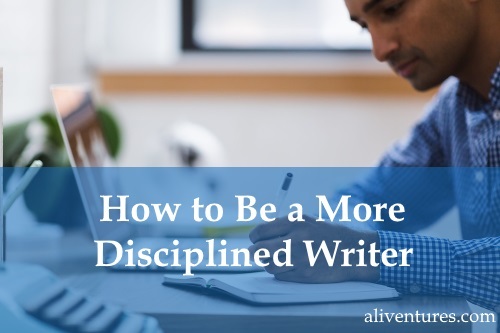 Whether you’re a freelancer, a novelist, a poet, or a student, you’ll be a more successful writer if you’re more disciplined about your writing. Hitting your agreed-upon deadlines is critical if you’re a freelancer or working with a publisher. Yes, some writers are decidedly flakey and don’t meet deadlines – you want to be a wonderful exception! Impress your client or editor by meeting every single deadline or milestone along the way, and if you can, turn in work a little early. Tip: Struggling with deadlines? Always allow plenty of margin for things going wrong. Set yourself an earlier deadline (I like to aim for two or three days early) so you can get ahead with your work: that way, you won’t have to rush things at the last minute. When you’ve made a commitment to write, do your very best to stick to it. Personally, I don’t think you need to write every day. You might not even write every week. But you should look ahead in your calendar and block out suitable times to write … and then treat them as important, fixed commitments. Tip: If you’re at a stage in your life/career where things often change at the last minute, allow for this. Plan more writing sessions than you actually want so that if you have to skip one, you can easily make up for it later in the week or month. Do you ever write a sentence or two, then stop to see what’s happening on Facebook? Or do you pause to look up a quick fact or name … only to end up reading webcomics instead of getting back to writing? It’s so easy to end up breaking out of the flow of writing – and this can hugely slow you down. Tip: Don’t rely on willpower unless you have to! Turn off your internet connection (or use a browser plugin to block distracting websites), put your phone out of reach, and use headphones to block out external distractions. The first draft of your piece (especially if it’s fiction) isn’t the place to worry about disciplined writing. My first drafts are invariably messy, with plot holes, run-on sentences, dodgy spelling … and it doesn’t matter. What’s important is taking the time to edit carefully: to prune away self-indulgent or clumsy bits of writing, and to shape that messy draft into a polished finished piece. Tip: Get some space from your first draft before you edit. You might want to take a few days (or if it’s a long piece like a novel, a few weeks) off from writing so that you can come back to it with fresh eyes. Discipline isn’t about being boring. You don’t have to stick to a rigid routine, or write in a stilted way. Instead, discipline is about self-mastery: it means sticking to your commitments and treating your writing as something important. Something that matters enough to be taken seriously. What one thing could you do this week to be a more disciplined writer? Share it with us in the comments, if you like … and then go and do it! Great blog post. When I sit down to write a blog post; it usually takes me two or three sessions even if it’s a 700-word blog post. It’s just my way of getting stuff done. The important part is that I always edit the blog post next day – and polish it further after a day or two. You’re right about coming up with a fresh mind – this is exactly what I do. I don’t always have to deal with 700-word blog posts – most of my blog posts are around 1,500 words long. The numbers don’t matter, of course. I enjoyed reading this blog post. Thank you. Very very useful article. I’m read with pleasure. Thanks.